Apple isn’t at CES, but its influence is easily discernable, from keynotes to the show floor. There are the usual hordes of iPhone cases and accessory booths dedicated to the iPad of course. But even outside of that, it seems that most companies that operate in Apple’s chosen arenas have just given up entirely and begun a game of follow the leader. The hilarity began with a slide that was displayed during the Acer press conference, showing off its new cloud service for photos. 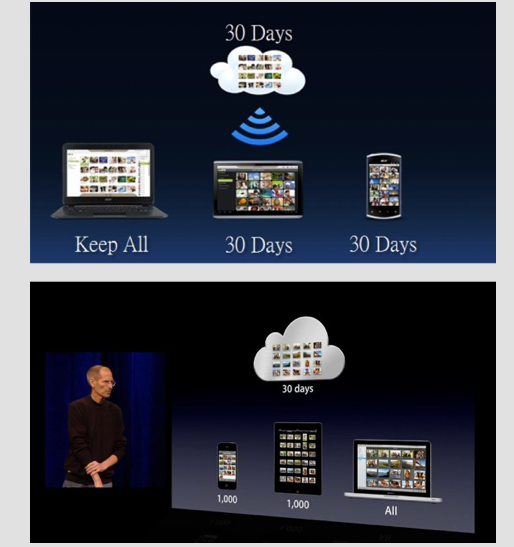 The slide mimicked the Photo Stream slide from Apple’s iOS 5 announcement so closely that it was downright comical. The service mimics Apple’s offering as well, with photos uploaded from mobile devices and from your computer being made available to them all for a 30-day period. Acer wasn’t the only one offering up a cloud service that seemed designed to take an aggressive stance against Apple’s iCloud either. A large portion of Samsung’s keynote was given over to its expanding AllShare service that allows you to view your media on any of Samsung’s tablet, phone and TV devices, as well as PCs. 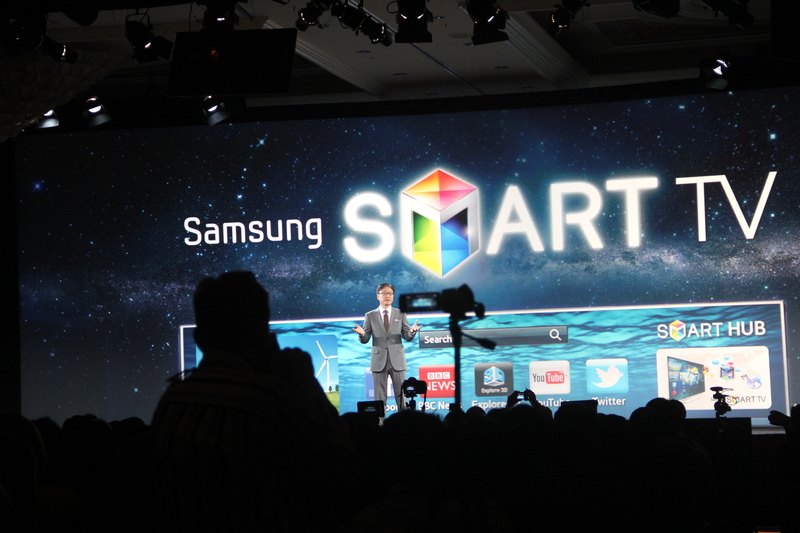 Part of this is Samsung’s AirPlay-clone ‘AllPlay’, which streams content from mobile devices to its televisions. 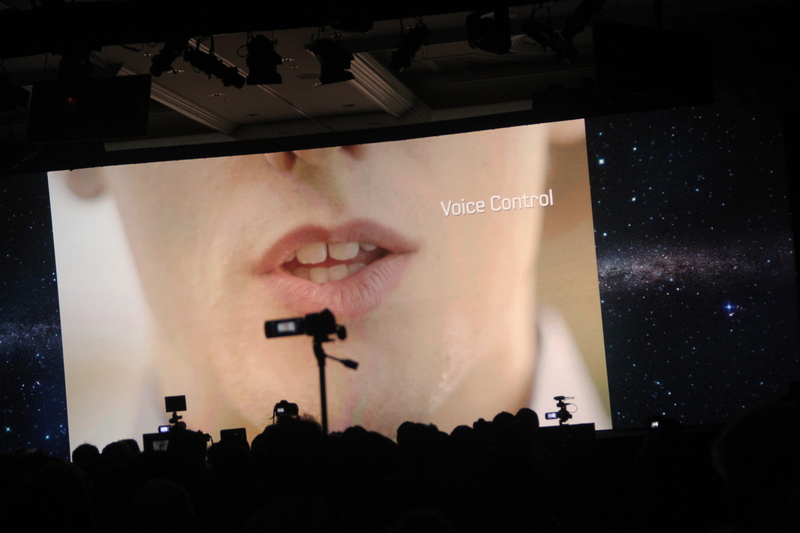 Beyond that there was the company’s focus on voice (and gesture, a bit of a jab in Microsoft Kinect’s direction) control on its smart TV’s. This time in response to a product Apple has yet to announce, its rumored television which would presumably include Siri integration. Then there was the hyping of its new Series 9 laptop, a very beautiful and very solid example of the industry response to the MacBook Air. On top of the features and products was an overarching theme of ‘connectivity’ (read: ecosystem lockin) and user experience. Both areas where Apple not only excels, but can be argued to have nearly cornered the market in recent years. Nick Wingfield has a great piece up at The New York Times about the way that companies at CES are trying to live up to Apple’s standards in UX. This was evident throughout the show as companies from Nokia, to Samsung, Microsoft and even Intel, as it entered the smartphone fray with a reference design and a Lenovo partnership. There was also a general slimming to be seen in product lines, with Sony, Acer, HTC and more trimming down their offerings to provide the consumer more focus. Apple has had a lot of success with this approach, offering just three models of iPhone, compared to the dozens of Android phones available from some manufacturers. What is really surprising is that out of all of the various pretenders to the throne, Microsoft and Nokia are the ones that seem the closest to getting it right. 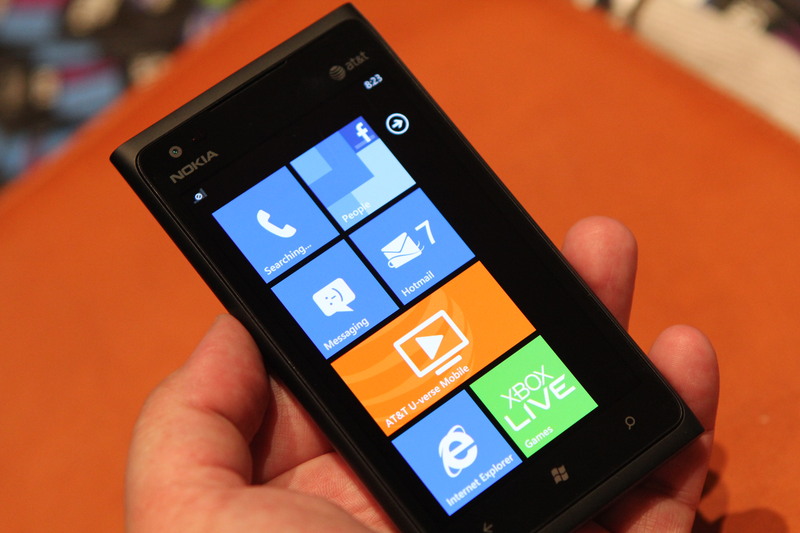 The Lumia 900 is a great looking phone, despite the positioning of its charging port, and Windows Phone Mango is widely considered to be the next best thing to Apple’s iOS in the ease of use department. Not coincidentally, the Lumia line is currently also very simple, with just the 710, 800 and 900 on display. This is extremely similar to Apple’s Human Interface Guidelines, which are extensive breakdowns of the basic way that apps for iOS and OS X should work. These have contributed extensively to the general quality of apps on its platforms. Although Google says that these are merely ‘suggestions’, I wouldn’t be too surprised to see them morph into something more concrete. Honestly, much of what I saw here at the show felt a bit desperate and flailing. During endless keynotes and meetings where companies described their own personal cloud services I found myself wondering which, if any, of these would be defunct by the next CES. At the root of it was a profound lack of realistic expectations on the behalf of the public’s willingness to adopt all of a company’s products in order to gain the benefits of its services. Although Apple doesn’t exhibit at CES, the show was far from free of its influence. The company has shown that its concentration on a few well designed devices with a great user experience and tightly integrated ecosystem is a winning track. Now its time for one or more of these competitors to put up or shut up. Although they both have their work cut out for them, my money is on Nokia and Microsoft.